Standard-issue spook fare that never amounts to much but is still promisingly atmospheric in spots, distinguished by its unusual, turn of the century setting. Many horror movies are set in old dark houses, few on the other hand are set in the old, dark superstitious past itself which is odd since, for all our Amityville Horrors, I imagine most people still tend to psychologically associate ghosts and haunted houses with the Victorian past. The primary distinction of The Woman in Black lies in its being placed in that transitory time-frame when the horse and buggy era was making way for the mechanized age of the automobile. In fact a relatively newfangled contraption called a car is brought into direct play in the most imaginative and unsettling sequence in the picture, when Daniel Radcliffe’s Arthur Kipps, a solicitor who has been sent to settle the estate of Alice Drablow in an isolated area of northern England, attempts to retrieve the body of the Drablow boy who drowned in the marshes surrounding the family manor. Passing through the superstitious village to find doors and shutters barred at his approach, Kipps is rather like Renfield on his way to castle Dracula, just the latest blood sacrifice to revivify the ancient evil lurking there. The most imaginative aspect of the movie is the exquisite, period production design which places the nearly inaccessible Eel Marsh House in the middle of a desolate wasteland of treacherous, tidal mud flats. Stretching off to the horizon like some eerily still Sargasso Sea, the concept is similar to Scandinavian horror films in which the elements and terrain themselves become another character in the drama, conspiring to entrap our hapless hero in the house of horror. If one veers from the narrow road, or becomes disoriented in the fog, they’re likely to be lost in the mucky marshes that swallow horse, buggy and body as swiftly and thoroughly as quicksand. This is why it’s so unsettling when Kipps goes diving for the boy’s body; not only is there zero visibility beneath the peaty surface, but we’re more squeamish than he is about what might be swimming around in the quagmire. When he locates the sunken buggy with the body inside and the men try dredging it up by hooking a rope around the bumper and putting the car in reverse, it’s heart-stopping to hear it stall under the weight, then being tugged toward the edge of the bog as the priceless treasure sinks back beneath the shifting sands. We’re watching a harrowing scene out of folklore, an archetypal contest between four-cylinder horse power and the horse carriage intent on returning to the primeval ooze of time immemorial. Cinematographer Tim Maurice-Jones’ camera, placed at a distance, captures the surreal sight with understated eloquence, the isolated action illuminated solely by the car’s flickering lamp lights, which pierce the inky blackness that threatens to swallow Arthur up as surely as the marshland. Even after baring it all in Equus on the London stage and anchoring How to Succeed in Business on Broadway, it’s hard to believe Daniel Radcliffe is all grown up now, and old enough to play a father (if to a very young son), no less. I was never a devoted follower of the Harry Potter franchise, but it was impossible to ignore its pop cultural impact. 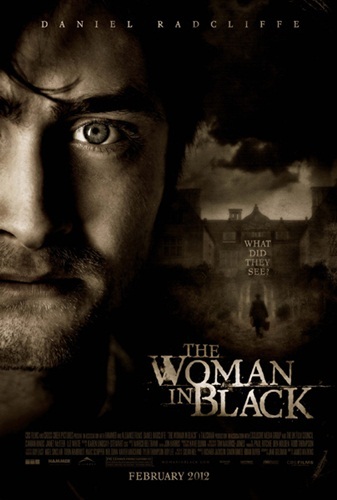 The Woman in Black offers Radcliffe his first adult role in a big-budget, mainstream Hollywood movie since the series ended and minus the owl specs he’s virtually unrecognizable when outfitted in Edwardian cutaways. But while Radcliffe doesn’t disgrace himself, this isn’t the sort of part to confer any sort of distinction upon his career either, and that’s through no fault of his own. An unusually tony supporting cast, headed by Ciarán Hinds and Janet McTeer, fair no better. The retrieval of the boy’s body from the marsh isn’t a task embarked upon to settle his unquiet spirit mind you, but because his wrathful mother, the wraith-like creature of the title, is not only restless but out for blood. Every time her specter is spotted, it entails certain death for one of the village children as surely as the shriek of the banshee. Janet Goldman adapted Susan Hill’s novel of the same name, which had earlier served as the basis of a made-for-TV movie, and though The Woman in Black was directed by a man, James Watkins, this vision of an overly possessive mother whose reach extends beyond the grave is by and large a female conceived concept, which makes it all the more fascinating. This ghost intends to make other parents suffer in retribution for having endured the loss of her own son, but it doesn’t make sense that she should prey on innocent children who had no hand in contributing to her misery, or that she would exact vengeance across the board in such an indiscriminate manner. As a vision of wounded motherhood, one would think that she should instead have a vested interest in protecting other innocents from harm, instead of acquiring them like prized additions to the growing collection she’s been hoarding to replace the one son she lost, keeping all these lost souls in a permanent state of suspended purgatory by preventing them from crossing over into the light. This is a nightmarish vision of suffocating motherhood; she murders young offspring to ensure they never leave the nest, can never be taken from her, as her real boy once was. In essence, she’s the manifestation of that black raven that swoops down on Kipps, giving him such a start when he’s caught messing around with her hatchlings, trying to help one fallen sparrow back into the nest. The movie’s basic premise, in which kids are psychically induced to commit suicide in increasingly gruesome fashion, certainly puts a damper on one’s enjoyment of the picture and heralds something of a depressing new trend on screens, released so close as it was to The Hunger Games, in which kids are ordered by the state to off one another for the entertainment of the masses. The average age of actors it’s now deemed acceptable for movies to depict being sadistically immolated, drowned and brutalized, all in the name of a cheap thrill, has been reduced by half. Even prepubescents have become fair fodder in horror films nowadays, their lives snuffed out before they’ve even begun. The movie seems steeped in as black a shroud of depression as its mournful lead. There’s the implication of a link between Kipps and The Woman in Black, both being incapable of coming to terms with the untimely death of a loved one, unable to lay them to rest in order to move on with their lives. She lost her son, and he lost his wife in childbirth. Perhaps this is why she performs her final act of ‘mercy’ in that ill-conceived ending, which allows the little family to be reunited in the afterlife rather than adding Kipps’ child to her menagerie of otherworldly orphans. Strangely, this finale somehow manages to cross reference memories of both The Curse of the Demon and Ghost, with perhaps a sprinkling of The Sixth Sense thrown in for flavoring. It’s the sort of unsatisfying denouement that seems to have all its bases covered, but actually leaves audiences bereft of any sense of closure since the murders haven’t stopped and are fated to continue on and on, leaving The Woman in Black both victorious and forever damned to her state of perpetual mourning, cursed by her inability to move on the way Kipps now has, after a manner of speaking. Since the story is laid out for us a few scenes in, and any forthcoming revelations preempted instead by a standard collection of cheap shocks that leap out at us from the dark to say boo, the plot fails to thicken into a quagmire to match the one that surrounds the haunted estate. No illuminating moments afford us any additional insights, or impart a sense of deeper meaning to these goings on. Goldman’s screenplay is left skimming the surface, afraid of delving below. Movies like these don’t seem to understand that what’s really frightening is the unknown and intangible. When you explain everything away like The Woman in Black does so early on, you’re depriving the movie not only of its mystery but of any unsettling psychological complexity. It’s clear director Watkins is on unsteady ground when Kipps espies the indistinct figure of a female watching him in an upstairs window of the abandoned Eel house, and the camera then moves inside, shifting its vantage to the ghost’s perspective, forcing the audience to see things through her eyes rather than the hero’s, as if we were meant to identify more with the insane wraith. This camera placement also robs the film of the suspense it subsequently should hold concerning what Kipps will encounter when he reaches the room to investigate. Unlike him, we’ve just been up there, so the thrill is gone. When directors can’t douse the screen with gallons of blood, they invariably fall back on the same tired old tricks that were considered cliché by the end of the silent era, when they were being satirized in movies like The Cat and the Canary. Movies need to find new ways to scare audiences in order to recharge chillers like this. Horror is the one genre in most desperate need of revitalization, but unlike Westerns or Musicals, it never seems to go out of style long enough to allow new concepts to emerge. The Woman in Black is set a hundred years ago and to contemporary eyes, its stock effects still belong to that earlier age. The movie’s a moth-eaten bag of rattling old bones, distinguished only by the new air of modern menace in which not even children are safe from the mother of all bogeymen. This entry was posted in Historical, Thriller and tagged 2012 films, British Films, Ciaran Hinds, Daniel Radcliffe, ghosts, Hammer Films, Harry Potter, haunted houses, horror films, James Watkins, Janet McTeer, Susan Hill, The Amityville Horror 1979 movie, The Curse of the Demon 1957 movie, The Sixth Sense 1999 movie, The Woman in Black 2012 movie. Bookmark the permalink.